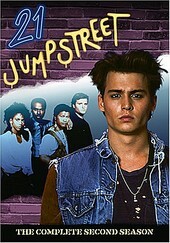 One of the first shows to air on Fox when the then-baby network launched in April of 1987, 21 Jump Street was also one of the network's biggest hits, launching the career of one Mr. Johnny Depp. For those unfamiliar with the show, 21 Jump Street follows four underage looking cops who were too baby-faced to work in uniforms, so they get re-assigned to the Jump Street Chapel (located at 21st and Jump Street, hence the show's name) to infiltrate high schools and help rid them of felons. Created by Patrick Hasburgh and Stephen J. Cannell, the show stars Johnny Depp as Tom Hanson, Peter DeLuise as Doug Penhall, Dustin Nguyen as Harry Truman Ioki, and Holly Robinson-Peete as Judy Hoffs. Steven Williams plays Captain Fuller, which rounds out the Jump Street crew. Season two finds these five coming together and working well as a team. Whereas season one was well-written and had interesting storylines, and saw the characters coming into their own as they developed their identities and characteristics, season two blossoms as everyone hits their stride, working well alongside each other and seeming more-than-comfortable, even natural, as a group, marking the most memorable (and best written) season of the show's five-year run. One problem that was persistent in season one and still haunts in season two (though not so much) is the removal and changing of the soundtrack throughout the episodes, with pieces that appeared in the original air date versions no longer on the DVD counterparts (due to licensing and clearance issues). The problem was much more rampant on season one, but still holds season two back. And while longtime, die-hard fans will instantly recognize this and scoff at it, for it helps kill some of the nostalgic value for which these DVDs are being purchased and enjoyed, the episodes' strong writing and excellent acting save the ship from drowning and still find each and every episode holding up well with time. Though there is no color insert booklet, and no interviews with the actors (which were all contained in season one), season two features audio commentary from Peter DeLuise (who also does commentary on season one), and his commentary is once again insightful, funny, and fun, making up for, in some regards, the difference in a portion of the music. When all is said and done, Anchor Bay Entertainment, along with Cannell Productions, has done a fine job in resurrecting this gem of a show and releasing it to the DVD buying public. 21 Jump Street -- Season Two offers all the excitement, thrills, and entertainment that you remember and love about the show -- and more specifically, season two. If you're a fan of 21 Jump Street, it is highly recommended that you check this out (and also get season one, especially for the insert and bonus interviews with Holly Robinson-Peete, Steven Williams, and Dustin Nguyen). The show was ahead of its time, and season two, which tackles such hot topics as steroid abuse, crack addiction, racism, teen suicide, abortion, and AIDS, pushes the envelope and helped create a milestone in programming. I'll give it a B+.